When a historic home by an esteemed architect goes up for sale, you hold your breath that the right people find their way to it. There’s a responsibility inherent in such a house—a call to honor its past while ushering it into the future. This house designed by John Howard Stevens, son of renowned Maine architect John Calvin Stevens, fell into just the right hands. 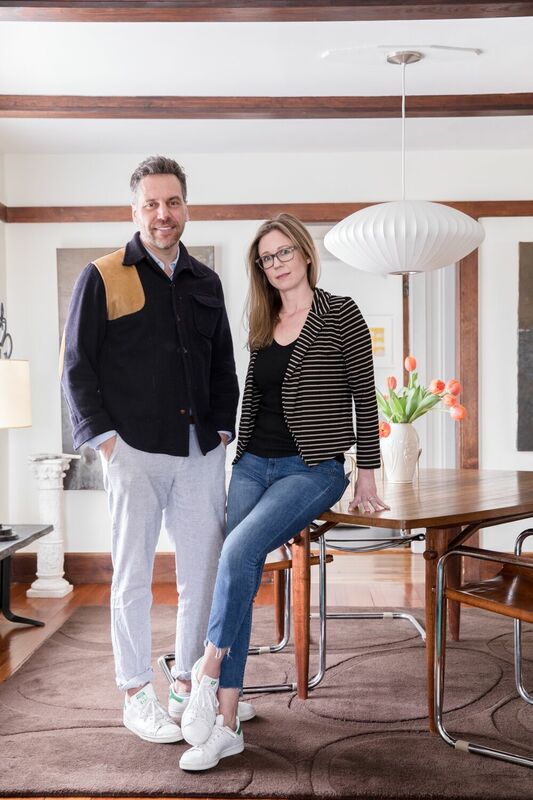 Ali Malone and Ben Ray share a love of real estate, art, and design, and their enthusiasm for creating eclectic spaces has found the perfect home here. Ali is a broker at Portside Realty Group and a real estate development consultant, and Ben is the founder of Evangeline Linens. The couple also owns Urban Edit, a company that buys, renovates, and resells homes. With their combined skill set and passions, the couple is poised to be the home’s careful stewards for years to come. Read on to get a glimpse inside their lives and this historic space. "We have both developed quite a love for art collecting and we especially love supporting local artists. Actually, maybe art 'addiction' is a better word." Leon Bridges for the adults. Michael Jackson on repeat if you ask the kids. Usually our kids. It’s their favorite hiding spot. David Sedaris, Theft by Finding for him. A full pile of guilty pleasure mysteries for her (don’t tell). Isa for dinner. Rose Foods for breakfast. Yankee Lanes back when the Bowl Portland league was there (pre-Bayside Bowl). We bowled in a league together for our whole relationship until this year. THE MAINERS: So you hit the historic house jackpot! How did you find the house, and what was it like the first time you laid eyes on it? ALI: In a strange twist of fate, I spent quite a bit of time in this house as a child. One of my good friends in elementary school lived in the house decades ago. I have memories of playing in the room that now belongs to my son. I remember it being a warm home that seeped with character. Reentering the house as potential buyers nearly three decades later was totally surreal. We had sold our last home in the West End the previous year and were in a short-term rental while we shopped. The process had been more daunting than expected, and the nesting instinct was strong (I was 8 months pregnant). We both walked into the house and just said, “yup, this is it.” We loved the character, history, light, layout, neighborhood—everything. The sellers had raised their family in the home, and I think they were happy to see it go to people with vision for the house’s future and respect for its past. It took some time to work through the details, but we closed on the house a month after Harlow was born and began making it our own. BEN: We were both on the same page when we saw the house. We knew we wanted to make an offer. We immediately started running through who would have what room, and what projects we wanted to tackle. For us, that’s a great sign. It had been hard to leave the West End, we loved it there, and this neighborhood shared some of the same vibes. That was important, too. And also, when you're without a home and your wife is 8 months pregnant, she’s the boss. THE MAINERS: What’s it like living in a piece of history? What speaks to you about the architecture, and how do you honor the history there? ALI: We both love Portland architecture and have lived in a series of amazingly different historic homes throughout the city. When we moved in together we purchased a federal-style building downtown that we converted to condos. We kept the third floor in the project. It was (to date) our oldest property, from 1818, and was on the National Historic Registry. We loved the process of restoring it to make it our own while also trying to honor the history. We did that process again just a few years later when we bought a bank-owned Victorian in the West End and brought it back to life. The two properties both felt very “us” even though they were very different architecturally. When we found this house it was so different stylistically from the other properties that we had owned but still felt like the totally right fit. As with our art and furnishings, we both have eclectic taste in architecture so it’s easy to shift from space to space. In terms of the John Howard Stevens component specifically, it was a real draw for me. I've shown countless properties designed by John Calvin Stevens over the years. They can vary greatly in style and grandeur but the layouts and thoughtfulness are consistent. Our house actually reminds me more of some the Great Diamond Island cottages than of the more “typical” West End type JCS architecture. I was drawn to the fact that JHS had designed this house to use personally (it was the first house he designed). He started his family in the house and you can feel that in the space. It has a casualness and practicality that spoke to me—it felt modern for the era. BEN: It has a bit of a California feel with the beams on the first floor. We’ve definitely dug into the history of JCS and JHS. Only a few other families have lived in this house, including John Howard Stevens. The home was built in 1904 as one of his earliest solo projects; he designed the addition in 1914 as his family outgrew the original footprint. His father, John Calvin Stevens, eventually moved from a house in the West End and built the house next door and his sister built and moved in to a house on the other side. We actually have a wonderful oil painting above the fireplace by John Calvin Stevens that he painted for his son. We’ve bought several books on JCS and even have (copies of) the original floor plans. THE MAINERS: Honoring the past while making some updates is a delicate balance, isn’t it? What were some of the first projects you tackled? ALI: The master bedroom and bathroom in the house didn’t work for me. It was dated and the flow and utility wasn't being maximized. We never even moved our stuff into the room. We worked with the talented group at Barrett Made to gut the rooms back to the studs and totally rework the space. I think it’s now my favorite space in the house. We vaulted the ceilings up and left all the old collar ties exposed. We actually combined what had been two rooms to create an office for Ben, tons of (well hidden) closet space, a spacious and bright master bathroom, and a large bedroom area. When the chaos of the family and working at home gets overwhelming it feels like a mini spa retreat to me. We painted the whole room white, trim included, which modernized the space quite a bit and is a nice shift from the darker trim in the rest of the house. BEN: We also dove right into some painting projects. Our den had been all dark wood paneling with black floors (not original to the house). We painted the whole room white, which made it much brighter. It’s a space that gets a lot of use by the whole family, so we wanted it to be bright and playful. Also, we both love being outside and we’re excited to work in the garden. The house had mature gardens, but we wanted to simplify them and work to create more usable outdoor space for the family. The second summer in the house we built a beautiful back patio. We have our Preway fireplace out there and have even just ordered some comfy new outdoor furniture. We put in a nice herb garden and have a grape arbor over the dining area. "I LOVE the credenza—it's supposedly a Kagan—in our living room that our record player sits on. We actually bought it off the people we rented from in between this house and our last. They were moving to New York City, and it was too heavy for them to move. The Lucite legs make it look like it’s floating." THE MAINERS: How does your style complement the house’s architectural bones? BEN: I don't know if it actually does. We buy what we like and throw it in a space to see if it works. It's eclectic and different and authentic. We strive to never have a space looking too much like a Design Within Reach showroom. (Although, we do love everything from Design Within Reach.) I’m not sure if our style fits with the house. I hope it does. But it’s our style and it’s what we love. ALI: Yes! What he said. It’s a lot of trial and error. And we both try to have fun with it. It’s easy to complement a house with great architecture. THE MAINERS: Ali, as a Portland native and a third-generation real estate broker, you have a deep-rooted appreciation for homes. What was important to you in finding your own home? ALI: I'll definitely sound like a broker with this statement, but LOCATION LOCATION LOCATION. We have to be drawn to the neighborhood and to the vibe of both the house in question and the neighboring properties. I also have issues with claustrophobia, I'm always drawn to houses that have a good, open flow, and I tend to like properties that are up high (all three of our houses have been up on hills) with some sense of openness and view. Light is also very important to me. This house faces south and the layout deliberately maximizes light. John Howard Stevens was also pretty progressive on the energy efficiency front. The house has overhangs that maximize passive solar in the winter, when the sun sits low in the sky. In the summer, the overhangs create shade and help to keep the house cool. I'm also a “structure person,” I like the nuts and bolts of a house and like to spend time down in the basements of properties to get a sense for how well built they are. THE MAINERS: Ben, how does your experience with and love for textiles get woven (no pun intended) into the design of your home? And how did you get started on Evangeline? BEN: For more than a decade, I have traveled the United States working in the textile industry. I have always been on the sales side of small Maine businesses (Angela Adams on the west coast, Transformit and Brahms Mount here in Maine). At a certain point, it just made more sense to branch off and do something on my own. I would have loved to buy into any of the above companies but knew that was never going to be an option. Evangeline, named after Henry Wadsworth Longfellow’s poem, is my new business. I’m making heirloom-quality Maine bed blankets and throws and am selling them across the country in small boutique stores and high-end linen shops. I am proud to own my own company and to be able to execute my own vision for luxury, high-quality goods. I’m proud of the Maine connection, too, as it inspires me every day. It’s great to be able to support the textile industry here. I’m so excited to grow and be able to expand and hire more people to join my team. Being in the home industry makes the home design stuff more fun, too. When I travel to trade shows and to visit the stores that carry my products, I always find tons of inspiration. It’s great to discover new brands, trends, and so on, and to be able to support the companies that support me. THE MAINERS: Your combined styles not only complement the house, but they work really well together—which often time takes some work. Where do you both get your eye for design from? ALI: I think we both enjoy, most of, the same design elements. The fun part, for me at least, is how our styles are compatible but our skills sets are actually quite opposite. I really enjoy doing layout work and color selection—paint colors are my jam. Ben is really great at the interior furnishings, sourcing products, and finishing touches. It’s fun to be able to complement each other. I was lucky to have grown up surrounded by great design. Both my parents have amazing taste and have instilled a great love and respect for the arts in all of their children. I remember my parents hosting “gallery shows” at their house and sometimes being allowed to choose a piece of art at studio openings. I also grew up around tons of property (my dad being a broker) and around renovations (I remember three big moves as a child—all with big projects). As a kid, we used to spend weekends at “apartment camp,” which consisted of using “elbow grease” to improve our family-owned apartments. Once you see the potential that a space can have if you invest yourself in it, the sky is the limit. BEN: I'm a bit OCD. I think it helps, as I like rooms to look and feel a certain way. 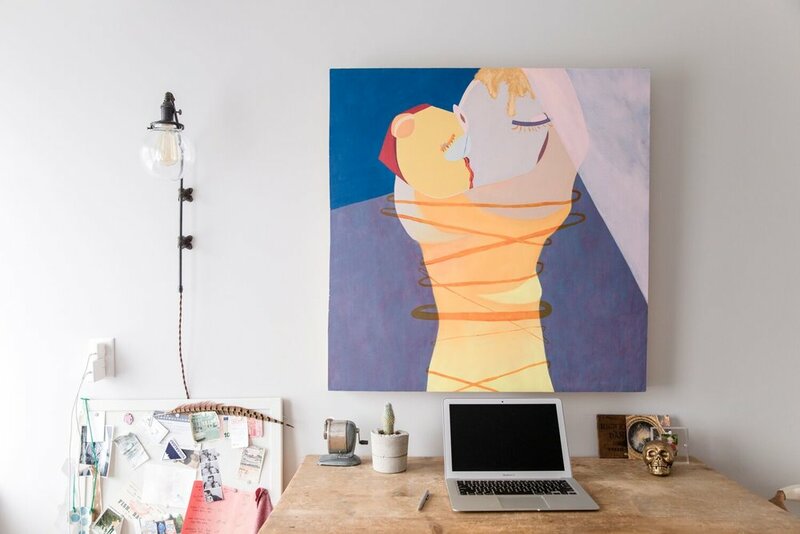 THE MAINERS: Tell us about your amazing and diverse collection of artwork. What are some of your favorite pieces? BEN: We have both developed quite a love for art collecting and we especially love supporting local artists. Actually, maybe art “addiction” is a better word. It’s nice that this is an area where our tastes are, usually, pretty well in line. 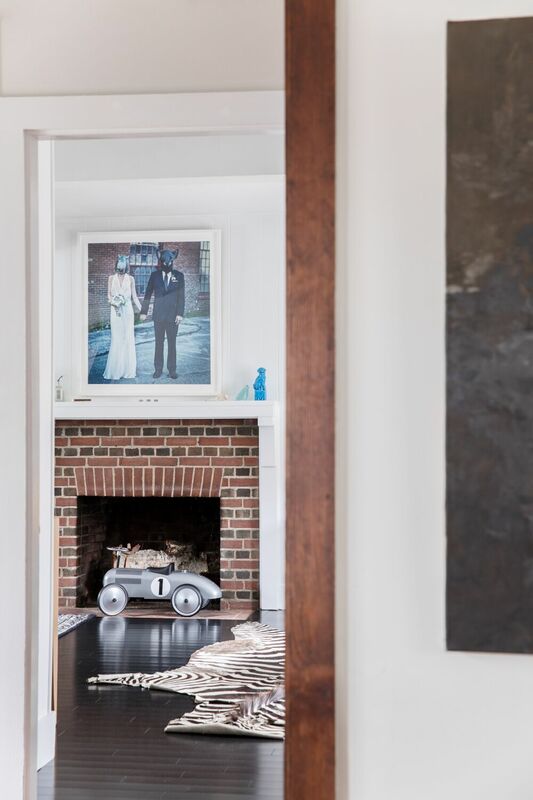 We coveted one of the pieces in our living room, a sort of modern portrait by Rob Sullivan, for so long that we each almost bought it for the other for multiple holidays. I finally won by surprising Ali with it for Christmas years ago. I found a piece at a junk shop up north that is a favorite of both of ours. It's a collage-style piece of two nudes in a beautiful frame. We have no idea who it’s by but that doesn’t matter to us. Having MECA in Portland is such a great asset for the city. We’ve met so many students and teachers who are so wonderfully talented and creative. We definitely get inspiration from there. ALI: Yes! Totally agreed. Portland’s art scene is so inspiring. Some of my favorite pieces are from artists that have been affiliated with MECA. The pieces by Tim Wilson are some of the first ones that we bought together. Also the wonderfully talented Michael Drodge and Anne Buckwalter. Our wedding photographer was Winky Lewis—she’s incredible. One of my favorite pieces is definitely a giant wedding photograph of us in our wedding attire wearing rubber animal masks that she took. It’s a fun version of the usual wedding shot. I also love our George Lloyd paintings. My parents have always collected his work, and he had an amazing show at the PMA a few years ago. I used to live in the apartment below him when I met Ben. The PMA is also such a great resource; the Contemporaries membership option is so great for ushering young people into the wide world of art. THE MAINERS: You also have a great mix of old and new furnishings. What are some of your favorites? ALI: I LOVE the credenza—it's supposedly a Kagan—in our living room that our record player sits on. We actually bought it off the people we rented from in between this house and our last. They were moving to New York City, and it was too heavy for them to move. The Lucite legs make it look like it’s floating. I also love the dining table by George Nakashima. It's so different from any other dining table you see around. I was so relieved that it fit in our dining room in this house! I also love our Womb Chair and so does everyone else in the family. We all fight over who gets to sit there in the morning. It’s really the most comfortable chair of all time. It was on both my and Ben’s wish lists for a long time before we finally found one on Craigslist that we could justify buying. BEN: I like the skulls and bones and zebra pelts and old things that are weird in form. We have this pelican skull that we found in Panama and brought back with us (very carefully). I also have quite a chair fetish. I really like our dining room chairs—chrome and worn leather really works. I might like the hunt for new and interesting pieces even more than owning them though. I’m really excited to be opening a retail shop in “the black box” on Washington Avenue this summer. I'll be selling Evangeline blankets and throws there, but I'll also be selling authentic vintage furniture and art. It will let me keep hunting even though out house is getting full! I’m going to be sharing the space with Amie Artisans, owned by Meredith Brockington, who is amazingly talented. She also is the photographer behind Evangeline. THE MAINERS: Speaking of shops, what are some of your go-to places to find items for your home? BEN: All our furnishings are sourced through Craigslist or thrift shops, Portland Flea for All, or secret spots throughout Maine. Like I said, I like the hunt and nothing is better than finding a buried score (figuratively and, often in Maine, literally). ALI: Or Marden’s. I am obsessed with Marden’s. We've gotten rugs, furniture, flooring, and even plumbing fixtures there. (No, I don't work there, ha.) It's always hit or miss but when you hit, it’s always amazing and such a bargain. And with Ben working in the design industry, we have wholesale access to great lines. 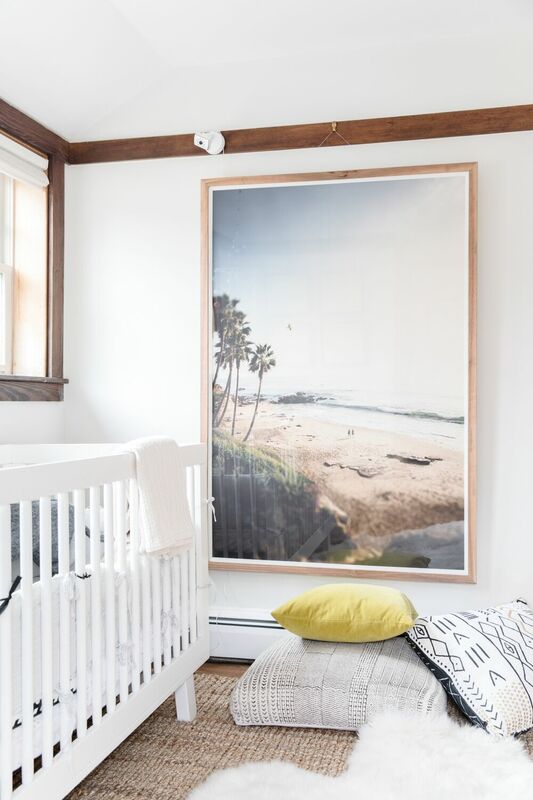 THE MAINERS: Does having kids change how you view or treat your space? BEN: We still have a white couch even with two kids under five. People are always shocked by that. I think we’ve taught our kids to be respectful of furniture but in the end, it’s all just things. ALI: I think we both decided that when we became parents we didn’t want to be totally buried in plastic. We try to be thoughtful about what we buy for them, and we swap stuff out on them all the time. We’ll hide stuff in the basement, then bring it back up a few months later and it’s like Christmas for them! We definitely had to get creative with storage options too. We have lots of stylish little bins everywhere so we’re not looking at the toys all the time. All this said, there is nothing that makes me smile more than finding a stray Lego while I'm gardening or a baby doll buried in my sheets when I go to bed at night. BEN: I've woken up with Legos stuck to my back—nope, not kidding. THE MAINERS: So what is one of your favorite family routines in this house? ALI: I love our morning ritual most of all. We have wonderful light in the living room in the morning. We all go down and get our morning drink (coffee for us and milk for the kids), and they play while Ben and I read the paper. We toss on a record and they’ll dance. We don't have a TV in the living room so there are no distractions, it's just a space to be together. One of the things that makes me feel most fortunate is that, since we work from home, we don't have a crazy rush in the mornings, and we can spend time as a family. BEN: Our dance sessions are so fun and give me a chance to play records. Atticus has some real moves. I also love having fires in the living room in the winter. 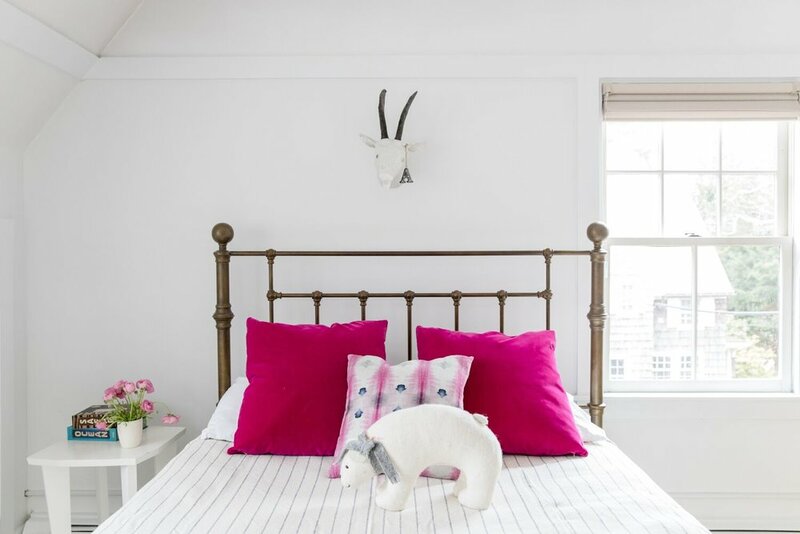 See more of Evangeline Linens here.